Stuck with fully cured Polyurethane Foam and or Resin Build up on your Equipment? Don’t let cured Isocyanates – Polyurethane Foam/Resin stop you from running a smooth operation! 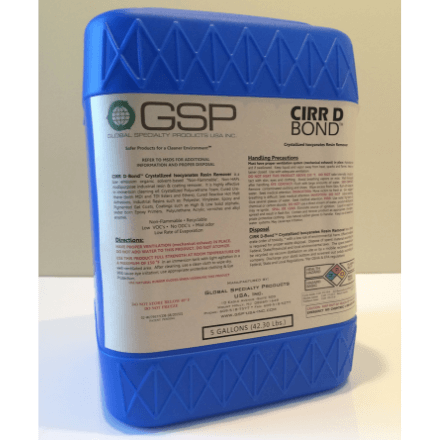 CIRR D-BOND™ is a non-HAPs, Low VOC, Immersion Cleaner developed to remove polyurethane foam which has been sitting on equipment and parts for months or longer. You Now Can REPLACE solvents like Acetone, MEK, & Methylene Chloride which result in high insurance premiums, by switching to an Environmentally Safe Cleaner. CIRR D BOND ™ Crystalized Isocyanates Resin Remover is an organic solvent-based multipurpose Polyurethane Foam Cleaner and Industrial Resin & Coating Remover. It is non-flammable, non-carcinogenic, non-mutagenic, non-teratogenic, water-miscible and biodegradable. This product is free of Acetone, MEK, Xylene, Toluene, Methylene Chloride, Aromatics & Aliphatic Hydrocarbons, Ketones and Chlorinated Solvents. It is highly effective in Immersion cleaning of spray equipment, mixing and metering equipment and feed lines, as well as loosening, and removing fully cured and aged urethane foam deposits and build-up from mixing heads, troughs, conveyor parts, side walls, rollers, foam cutting devices and molds. CIRR D-BOND™ goes beyond performance, it saves you costs across the board. A suitable replacement for Methylene Chloride, acetone, MEK, acetates, etc. Enhanced worker safety, environmentally friendly, non-hazardous, non-flammable, non-HAPs, NON-CHLORINATED, NON-AEROSOL, BIODEGRADABLE SOLVENT-BASED cleaner designed to remove Flexible and Rigid TWO COMPONENT Polyurethane Foam Adhesives. It cleans like Acetone & Methylene Chloride without the hazards. It is effective on both MDI, polyester-polyols and polyether-polyols as well as cured polyurethane adhesives. It provides fast, residue free, and complete removal of cured or uncured rigid urethane foam deposits and buildup from mixing heads, gear pumps, troughs, side walls, conveyor parts, rollers, molds, foam cutting devices, holding tanks, feed lines and mixing equipment. This product cleans down to the bare metal surfaces; it is easy to use. In addition, FOAM Off™- MP ELIMINATES disposal costs by recycling the spent material via vacuum distillation. All CIRR D BOND documentation, manuals and resources available HERE.